Hello again! The picture above has today’s Quote of the Day. I think it’s a good one about traveling and how some people don’t really appreciate the adventure of travel sometimes. 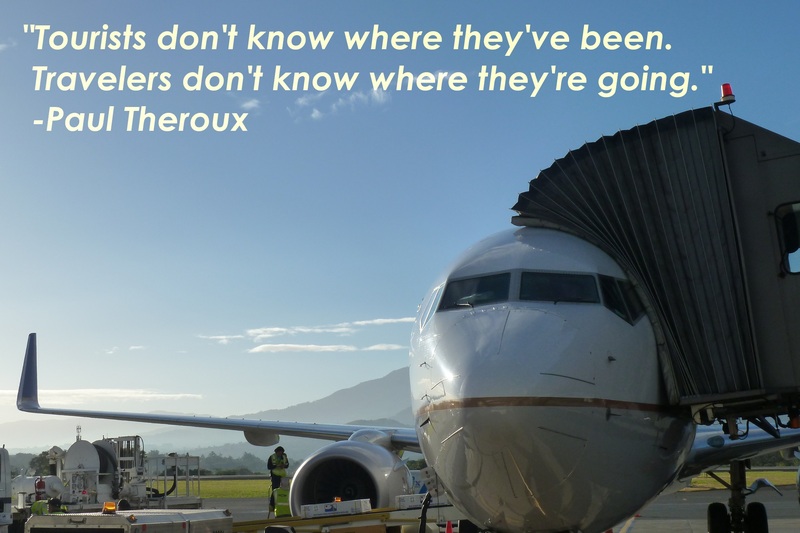 The author of the quote, Paul Theroux, is one of my favorite writers. I took that picture at Juan Santamaria airport here in Costa Rica when I was starting off on a trip, so it makes me feel adventurous when I see it. Anyhow, this week we’ve also been talking about phrasal verbs. This is one of the most difficult aspects of the language for people learning English. You probably have heard and used phrasal verbs, but you might not have even realized it. Basically, they have two parts: (1) a verb and (2) a preposition. The verbs are usually easy, but if you change a preposition, you can change the meaning of a phrase completely. That’s just one example out of thousands. So as you see, these can be tricky. I want to recommend two lists of these verbs. This one is a bit more extensive and has good examples of common ones. This one is even better and goes into more detail for 50 of the most common phrasal verbs, but since it is more detailed, you’ll need to take your time to read through it and then practice the verbs. And unfortunately, that’s about the only way to learn these things well: lots of practice and studying. Native speakers use these all the time, so if you want to improve your English vocabulary, this is a very noticeable way to do so. As I mentioned above, this is directed towards my students, but anyone who reads this can respond. 1. Read through one or both of the links that I put above (and also sent by email). When you understand some of the phrasal verbs, choose 10 of them. 2. Write a short story about a trip. You can tell a real story or make one up (invent one). Your story should use the 10 phrasal verbs. Try to identify the phrasal verbs, either at the beginning or end of the story, or by writing them in italics, bold, or CAPITAL LETTERS. 4. When you’re done, you can also comment on a classmate’s story when they’re posted. Have fun with it and try to be creative! My last trip was amazing actually it was a family trip. We, decided to go the beach on vacation. At the beginning the journey was CALLED OFF because, my little niece got sick but fortunately she GOT OVER, the day we traveled I WOKE UP very early to make the bed and PUT AWAY everything in my room. I remember my brother telling their children !common HURRY UP! I must ARRIVE ON time ! by the way! I LOOKED AFTER them during the whole trip. Perhaps the most loved moment was when we all MET UP for lunch in the cabins and also when the baby was PICKING UP shells, sometimes BRINGING UP children has it’s rewards. My last trip was amazing. I was in Panama City to watch Bad Religion, a great punk rock band that I love. All it START UP when my friend Juan Diego told me about the possibility that they perform in Panama. At the start I wasn’t too convinced, because I FOUND OUT the band haven’t advertised that date in their official web site yet. You know I HUNG UP about they CALL OFF the concert after that we had bought the tickets and also had paid for the trip. A couple of weeks later they did it, and we decided to pay for the trip and TAKE some days OFF for vacation to be ready for the concert. We had two options to go, by plane or by bus, at the end we PICKED OUT by bus, because it wasn’t so expensive and the enterprise offered us an entire package with the hotel, tours, breakfast, and also the tickets for the concert. We leave Alajuela on Thursday at 11.00pm and we arrived to the border until Friday 4:00am. There, you must to FILL OUT some forms to pass to Panama, and then we did continue with our trip. It was very long and tired, fortunately I bought a pill for help me to sleep, and it made me FALL ASLEEP like a baby while we were rolling. Finally we CHECKED IN at 6:00pm to the hotel, had a rest, and lately we ATE OUT in a near restaurant. On Saturday we had breakfast and prepared for the tours to Panama’s Canal, old Panama City, modern Panama City, Ave. Amador and Americas’ bridge. In the afternoon we CAME OUT to the concert but I didn’t imagine how much luck we will be, we END UP in first line, just in front of the stage. It was the best punk rock concert ever! At next day we rested in the hotel and in the afternoon we went to Albrook Mall to buy some things before we CAME BACK to Costa Rica. I forgot to buy my hard drive but that’s another story hahahaha. We arrived to Costa Rica at 11:00am, had a lunch in a very nice restaurant, near of Parrita. Then we arrived to Alajuela at 4:00pm. It was a very short and tired trip, but for me was amazing, because I was expecting for the chance to watch Bad Religion alive and probably I will DO OVER if I have the chance. -“hung up” can mean “worried,” but it’s more of a chronic worry. Nice work–it sounds like you had a great trip, too! I’ve been to Panama, but never to Panama City, and I’d like to go. Hopefully some day! My last trip was amanzing, I went in Boston , I stayed 10 days, the second day I went to the mountains, was the first time I saw snow, I went to take lessons to learn to ski, but I had to fill out an application for star on for my class, I had to wear a lot of clothes because the cold was too much, and put on about 3 coats. In the night, we went to eat out in amanzing restaurant, near the all snow. was great there, was a bit better, more heat and sun, so I take some coats off. It was a great trip for me and I loved the snow but it was frozen with so cold. Thanks for your comment. I think you were absent last week on the day we talked about this, but you seem to also be having an issue with having really long sentences. Other than that, your content is pretty good. For vocabulary, you’d say “see” the capitol, not “meet” it (since it’s not a person), but the rest is clear. My last trip was amazing! Some months ago I went to Nicaragua. All STARTED OUT When my Father GAVE me AWAY a trip, but He told me that I PICK OUT the place, but I did not know where, so I started LOOK INTO internet and I FOUND OUT a good place, Montelimar hotel. The day before the trip, I packed all my things, I SET OFF the alarm to the next day and the most important HOOK UP my cell phone. The first day I WOKE UP very early in the morning and I did not have time for breakfast so I had to EATING OUT in a restaurant in Peñas Blancas. When I arrived to hotel I had to CHECK IN my reservation; after a few days my trip ended up. -Probably you’d just say “gave me a trip,” “found a place,” and “set the alarm,” since these verbs work better in this context without the preposition. Anyhow, those are small changes and like I said, it’s clear. Nice job–see you in class this evening! My last trip was amazing!!! I want to tell about my trip to Panama. Last saturday I WOKE UP very early because I had to make the CHECKED IN at 6 am. The flight was very short, it lasted 45 minutes. When I arrived, my boyfriend was waiting for me to PICK ME UP outside the airport. After that, we immediately went to meet his family. who were eager to SHOWED ME OFF off their country and I was happy to JOIN IN with all of them. Last night we went to EAT OUT . We visited a beautiful restaurant located in ” Casco Antiguo” , place full of culture and history. I’ve also been shopping and I TRIED ON a lot of clothes and shoes, at a very cheap prices. I’m still enjoying the beauties of this country where high temperatures prevail,but the culture, food and it’s people make this place wonderful. Sounds like you’re having a great time in Panama! Nice post, too. Other than that, it’s very clear. Nice work! Thank you Ryan for your comments. I will take them in account next time.